KSW Federation has teamed up with the biggest MMA organization in Brazil - Aspera FC the first installment of the tournament will be lightweight Road to the KSW. 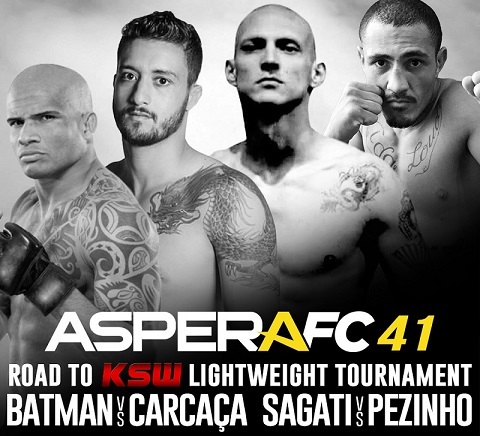 Already on July 9 at the gala Aspera FC 41 in Sao Jose with multi-pin contract KSW will compete with four fighters in the limit to 70 kg: talented Guilherme "Carcaca" Miranda (14-4) and Fernando "Sagati" Aparecido (7-1) experienced Ivan "Batman" Jorge (26-6), and effectively fighting striker Renato "Pezinho" Gomes (16-8). The event will show the greatest sports channel in Brazil Esporte Interativo.